1 Preheat the oven to 220°C, gas mark 7.Cook the celeriac in boiling water for 10–12 minutes until tender. Drain well, then purée in a vegetable mouli or food processor. 2 Meanwhile, melt the butter in a small pan over a medium heat. Brush 2 large ramekins with a little of the butter. Stir the flour into the pan and cook, stirring, for 1 minute. Off the heat, gradually whisk in the milk, then return to the heat. Bring to the boil, stirring constantly, to give a thick, smooth sauce. 3 Take the pan off the heat and stir in the celeriac purée, apple and Stilton, followed by the egg yolk, mustard, cayenne and seasoning. You can prepare up to this stage 24 hours in advance, cover and keep in the fridge until needed. 4 Whisk the egg white until stiff but not dry, then carefully fold into the celeriac mixture. Spoon into the prepared dishes and place on a baking sheet. Bake for 10–12 minutes until well risen and golden. Serve immediately with dressed salad leaves. If you would rather get most of the preparation done in advance, you can double-bake the soufflés. Remove them from the oven in step 4 and leave to sink down and cool. Chill for up to 24 hours until needed. To serve, preheat the oven to 220°C, gas mark 7. 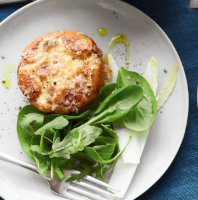 Turn out the soufflés into a small ovenproof dish, spoon over 2 tbsp double cream and sprinkle with 2 tbsp grated Parmigiano Reggiano. Bake for 10–15 minutes until hot and puffy — they won't be as puffed up as the original, but still delicious. This recipe was first published in Tue Dec 23 12:25:30 GMT 2014.